EPF members who are withdrawing a PF amount of more than 50000 Rs in below 5 years of service need to submit 2 copies of form 15G and 1 copy of PAN card. If EPF members fail to submit form 15G then 34.6% tax will deduct from their PF claim amount or sometimes EPF officials will reject the EPF claim. EPF members whose age is below 60 years need to submit form 15G and for above 60 years form 15H is required. Write the name of the person who is submitting form 15G. Field 4 Previous year If you are submitting form 15G form before 31 March 2019, then the previous year will be 2018-19. Field 13 Email id Write your email id. Field 18 Total number of Form 15Gs filed If you have submitted any form 15Gs previously, then mention how many forms 15Gs you have submitted earlier, otherwise leave it blank. 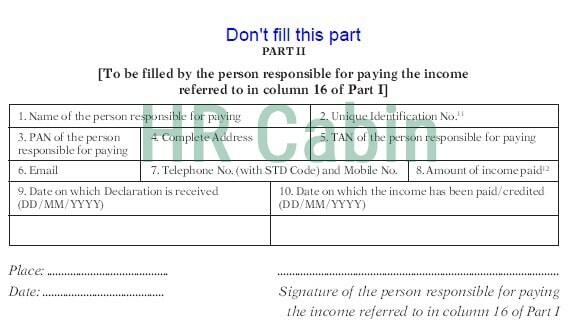 The aggregate amount of income for which form 15G submitted If you submitted form 15Gs previously then mention the total amount for which you submitted form 15Gs, otherwise leave it blank. Identification number of relevant investment or account For PF withdrawal you can leave this field blank or you can mention your UAN(If you don’t fill this field, then it will be filled by PF officials). For FDs write your Fixed deposit account number. Nature of income Mention whether it is FD, or EPF, dividends, or interest on securities etc. The section under which tax is deductible You can find sections in below table. If you don’t know the sections you can leave it blank. It is not a problem. Amount of income Mention the amount of income for which you are submitting form 15G. But as we know there is no option to submit form 15G for online PF withdrawal, you need to submit 2 copies of form 15G directly to your regional EPF office after applying for the online claim. On each copy of form 15G on top side write your PF number and UAN number. You have to submit form 15G within 1 or 2 days from the date of online claim submission. I worked in a company from 01/04/2014 to 24/09/2018. Employee share 58,981 employer share 18,044 pension 35,919 .In this duration my salary was 15583/Month. Currently i m not working. I want to withdrawl all of my pf amount now. 4 .should it be ? 15 b latest assesment year .? 16 sum of emp , emplyr share and pension (112944)? One of our employee resigned in March/2018. now in order to fill form in feb/2019. what should be FY/PY to write in form 15G??? Mention Previous year as 2018-19 and Assessment year as 2019-20. Submit PF form 19 and 10C in your PF office along with 1 copy of PAN card and 2 copies of form 15G, so that no tax will deduct from your PF claim amount. I worked for company A from May 2015 to April 2018. Now, I want to withdraw complete amount and clear the PF account, as I am now paying a Home loan. Also, After new days of leaving the company A, I got another offer from a different company with annual ctc of 4.5Lacks. I have not linked or transferred the previous PF account of Company A to new company. Please, I need urgent help me for fields of form 15G, Fields I need assistance with is – 4, 15, 16, 17, 18, and 19. Previously I have not withdrawn any PF, never had it actually. And I have no other income source. You have to submit form 15G to the PF office where your PF amount is maintained i.e your previous employer’s PF office location. I worked for 2 companies A ( 2015 – 2016) & B ( April 2016 – Nov 2016). My latest company was B and resigned in Nov 2016. Company A’ s total share ( including employer share + pension) is 40k. Company B’s total share is 50k. I haven’t transferred A company’s PF to company B. I have couple of queries. 1. Since I have submitted for PF withdrawal online, I received a call to submit Form 15G to avoid deduction of tax. What is the previous year to filled in point 4 ? How should I proceed with points 16 & 17 in Form 15G ? 2. Am i eligible to get PF total share of Company A which hasn’t been transferred ? 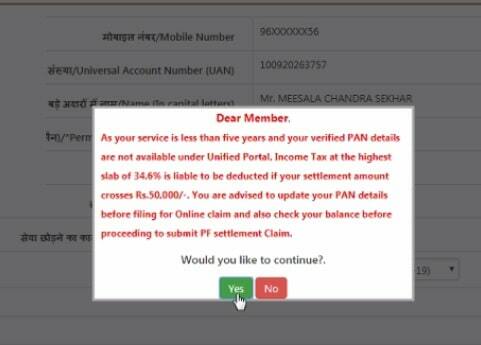 There is no need to submit form 15G online, only your PAN card must be linked with your UAN. I want to do part withdrwal of my PF account, i have less than 5 year of service. i want to withdraw 3.5 Lakh amount. Please help me with section 4, 16, 17 and 19 in details. I worked in a company from Aug -2016 to jan 2018. Employee share 27122 employer share 8288 pension 18834 .In this duration my salary was 16500/Month. Currently i m not working and dont have any source of income . I want to withdrawl all of my pf amount now. 4 .should it be 2016-2018? 15 b latest assesment year 2016-2018.? 16 sum of emp , emplyr share and pension (54244)? Hello sir , there is required sign of previous employer on 15 G form .. please tell me…. There is no need of signature of the previous employer on form 15G. I have sent my docs for PF withdrowls at your office.plz tell me about How many days will it take to get the amount in my bank account. I quit my job on April 6th 2017. I had no income after that. Could you kindly help me with what I should Fill in Section 4, 16 and 17? Thanks in Advance… Looking forward to your reply..
Field 19: If you have submitted form 15G in past then write those details otherwise leave that field blank. I have worked in an organisation for 2 year 8 months. And my employee share – 17051, employer share-5215 and pension contribution-11228. Should I fill form no.15g to claim my PF money? You don’t need to submit form 15G. & SIR Should I fill form JOINT DECLARATION BY THE MEMBER AND THE EMPLOYER TO CLAIM MY PF ??? Joint declaration form is to correct your details in PF portal offline, for PF claim you don’t need that. If mention amount in 15G colum 17. is more than 2,50,000 then TAX deduct from PF amount or not ? IF mention amount more than 2,50,000 Rs then TAX deduct from PF amount ? I would like to know about form 15G. I am not working anywhere and I will receive interest from FD – expected Rs 30000 in this financial year by March 2019. TDS is deducted over and above Rs 10000 interest amount, Am i eligible for 15G and what should I fill in column 16 & 17. I working before 2 years company. Did I fill 15g form.?. If you are claiming more than 50000 Rs then submit 2 copies of form 15G, otherwise, there is no need to submit form 15G. I have work before 2year company ,did I fill 15g form..?.